Goeie Zin is DE avond voor singer-songwriters en semi akoestische acts in Zaal 100. 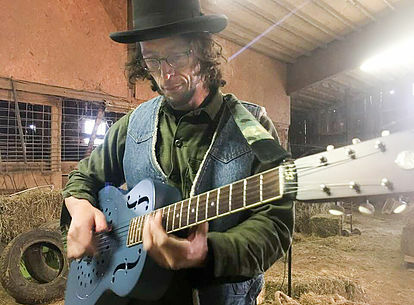 Feathered Mason is a longtime musician and award winning songwriter born a couple decades too late to a French mother and Midwestern father deep in the heart of Illinois. While early influences such as Hendrix, Zeppelin and Black Sabbath shaped his early blues psychedelic rock sound on guitar, regular trips to France listening to his twin uncles sing harmony & strum guitar secured a place in his heart for folk music. Many a band and decades later, after also emerging himself in the bluegrass community on banjo then finding his own slide of the country blues hill fingerpick’n on resonator guitars the Feathered Mason has taken flight! Now calling Nashville home – a true homecoming for an American roots lover & artist – his 2nd release, Feathered Mason – Limbo Boy, is available. It’s raw and genuine just like him. Maar eerst lekker eten vanaf 6 uur. De live muziek begint om 8 uur. Sowieso handig in Zaal 100.